What types of burns are there? Burns are described and managed by what caused the burn, how deep it is, where the burn is, how big it is and the age and health of the person who is burned. The most common burns are caused by heat, such as a scald from a hot object or liquid, or a flame. These are called thermal burns. Chemicals such as a strong acid or alkaline can cause burns. And electricity can burn if it passes through the body. Radiation can also burn, for example UV radiation from the sun causes sunburn. Sometimes it takes a few days to know how deep a burn is. 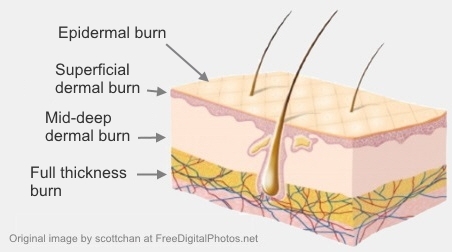 It is common for burns to be mixed, with different parts of the burn being different depths. If you have any doubt about how deep your burn is, seek medical help. An epidermal burn (also called erythema) affects the top layer of skin. The skin is dry and red, but without blisters, and will hurt when you touch it. Healing takes around seven days and it usually heals without scarring. A superficial dermal burn (also called a superficial partial thickness or first-degree burn) affects the top layer of skin. The skin often has blisters. It will look pink and moist, and be painful. Healing may take 10 days to three weeks. Burns that take longer to heal may leave scars. A mid-deep dermal burn (also called a mid–deep partial thickness or second degree burn) affects the deeper layers of skin. It will usually have large blisters and be blotchy red or white, but not be as painful. Healing is very slow. A full thickness burn (also called a third-degree burn) affects all three layers of skin. The burn wound will be very white, brown, or black, and can look and feel like leather. This type of burn generally needs a skin graft. There will be scarring. If you are concerned about your burn, talk to your GP or practice nurse. You may need to be referred to a specialist doctor. Burns on some parts of the body, such as face, hands and feet, can be more serious. So how the burn is managed will depend not just on how big it is but also where it is. Health professionals can calculate what percentage of total skin is affected. If you have any doubt, see a doctor or nurse, who can let you know how to treat your burn. You probably know that burns can be painful and can scar. But they can also cause other serious problems. They can cause fluid and heat loss. This is because when the skin is damaged it leaks fluid, and lets out heat. With very severe burns this can be life-threatening. Burn wounds can also get infected. This can cause significant illness, delay their healing and make it more likely they will scar. Some burns, like electrical burns, can injure internal organs. And when burns heal, the skin can pull together too tightly, restricting movement. This is called a contracture. Written by HealthInfo clinical advisers. Endorsed by Plastic Surgery Department, Canterbury DHB. Last reviewed September 2017.